Here at DCS Multiserve, we can provide you with office cleaning service that is tailored to the requirements of your organisation. 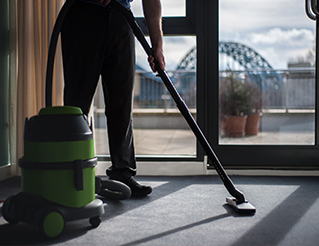 We ensure the regular, high-quality clean in all areas of your workplace, including office spaces, desks, all communal areas, staff canteens and kitchen areas. We also provide the cleaning of all washrooms, and can supply all washroom consumables for added convenience. Work is done to minimise any disruption to your day-to-day business, and our smart, uniformed operatives visit at a time that is convenient to you. In large complexes, we also implement a cleaning hierarchy of supervisors and charge hands, to ensure that work is delivered to the highest possible standard. Our professional approach to our industry allows us great flexibility in planning our work, and gives you, the client, peace of mind in the knowledge that your working environment will always be clean and tidy, for both the benefit of staff and visitors. Colour-coded equipment and products are used to avoid cross-contamination, and environmentally-friendly products are selected whenever possible as well as the use of the latest in cleaning tools and products so you can be sure of a thorough clean. If you would prefer a more comprehensive package, window cleaning and grounds maintenance services can also be arranged. To find out more, or to receive an office cleaning quotation, give our team a call today on 0191 216 9000 or email enquiries@dcsmultiserve.co.uk.